Ardara, one of the five designated heritage towns in Donegal, is situated in the beautiful south west region of Donegal. Close by is the Owenea River, where the salmon and trout fishing is widely regarded as one of the best in the country. Just outside the town is the spectacular Glengesh Pass on the road to Glencolumbkille. The town boasts top class blue flag beaches and a first rate links golf course. The name Ard a’ Ratha which means ‘high hill of the fort’ comes from the earthen ring-fort, which crowns the hill to the northeast of the town. Christianity was introduced to Ardara in the 6th century by St. Conall Caol who was a direct descendant of St. Colmcille. From the middle of the 17th century to the end of the 19th century the Nesbitt Family of Woodhill was closely associated with the commercial prosperity of Ardara. 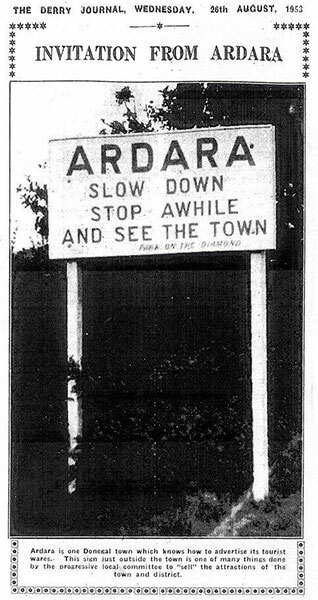 Ardara has been long associated with the tweed and knitwear industries. From the 1870’s this trade became a cottage industry with home spun and hand dyed woollen and tweed items being created. The Ardara Heritage Centre, formally the town Courthouse, profiles the development of the tweed industry. To this day several shops in the town still sell high quality tweed and knitwear. Ardara lays claim to some notable sons/daughters. Foremost among these is John Doherty born in 1900, one of the most revered Irish Fiddlers of the 20th century, a true exponent of the Donegal style. In sporting circles the Captain of the 1992 All-Ireland GAA Championship, Anthony Molloy, is an Ardara man as is Pat Shovlin who is a coach to the 2012 Senior All-Ireland GAA holders of the Sam Maguire. Bibi Baskin, a notable name in media circles during the 70’s and 80’s also boasts Ardara heritage. John Mitchel MP, the 19th century revolutionary nationalist leader visited Ardara, staying at the Nesbitt Arms (then called Maloney’s Hotel). William Allignham, Donegal’s famous poet (The Faeries) also stayed in this Hotel. Evie Hone the renowned stained glass practitioner features in Ardara’s Holy Family Church. Her beautiful Rose Window has been acclaimed worldwide. The Heritage Centre located within the centre of the town was established in 1992. The building goes back to historical times as the town Courthouse and then home of the Ardara Library. The focus of Heritage Centre is to define the basis of the Traditional Industry of Ardara which was the Tweed Industry. “In 1789 the number of houses in this county was 23,521, and although since that period there may be an increase in houses to a not easily calculated extent, the villages, which are about 500, are not on the increase, but dispersing daily into separate habitations and holdings. Towns like Ardara have been designated Heritage Towns due to their uniqueness and the diversity of their location, history, architecture, and people. Much of this diversity is evident in their architecture, from the the vernacular architecture of Ardara. However, these buildings are not museum-pieces, they continue to be occupied just as they have been for generations. A great deal of preservation for occupation is due to the efforts of individual local development associations. They give so much time and energy to the restoration conservation and enhancement of their prized local architecture while assiduously keeping an eye on encroaching developers. Ardara is situated close to the small River Owentocher. This heritage town is a major centre for the manufacture of hand-woven tweed with several shops along the main street selling tweeds and hand-knitted sweaters. While in the town pay a visit to The Ardara Heritage Centre – which houses an exhibition relating the history of Donegal Tweed. The pubs of Ardara are welcoming and friendly – the visitor can experience a rich mix of traditional music. The Owenea River provides unparalleled salmon and trout fishing and is widely regarded as one of the best in the country. Pony trekking along the golden sandy beaches is also popular. The spectacular link of Portnoo/Narin are within a short drive. Boating and surfing can also be enjoyed nearby with some of the best Blue Flag beaches within easy reach. From its origins as a crossing point on the Owentocker River, Ardara became a world-renowned centre for the manufacture of hand-woven tweed, hand knitwear, hand-loomed knitwear and embroidery. Ardara has a long association with the tweed and knitwear industries and was designated by Bord Fáilte as a ‘Heritage Town’ on the basis of this tradition of weaving and knitting. The Nesbitt family arrived in Ardara in 1669 and exerted a strong influence on the town’s development. The demise of the great fair at nearby Magheramore in the mid nineteenth century saw the fairs in Ardara begin to prosper and confirmed Ardara’s role as a commercial centre. In the Middle Ages, the reputation of Irish cloth as that of superior quality and lower price had been well established throughout western Europe. A 1688 act that forbade the sale of Irish woollen goods to anywhere except England threatened the continued existence of the woollen industry and traditional skills associated with it. By the beginning of the nineteenth century, the woollen industry existed on a small domestic scale. In the late nineteenth century, a market for homespun woollen goods was identified and the re-introduction of the art of dyeing made them a more marketable commodity. In 1893, a Congested Districts Board supported improvement scheme was started in the Ardara area and provided for the inspection of cloth and the stamping of high-quality goods. Tweed continued to be marketed on the streets of Ardara on fair days. A market house known as ‘The Mart’ was built in 1912 and used for the inspection, storage and sale of tweed. Despite a resurgence in the tweed industry in Ardara during the two World Wars, it declined markedly thereafter and continued on a smaller cottage-industry basis and, more recently, as a tourist attraction. Several domestic vernacular buildings, some original weavers’ cottages, echo Ardara’s early associations with the tweed industry.